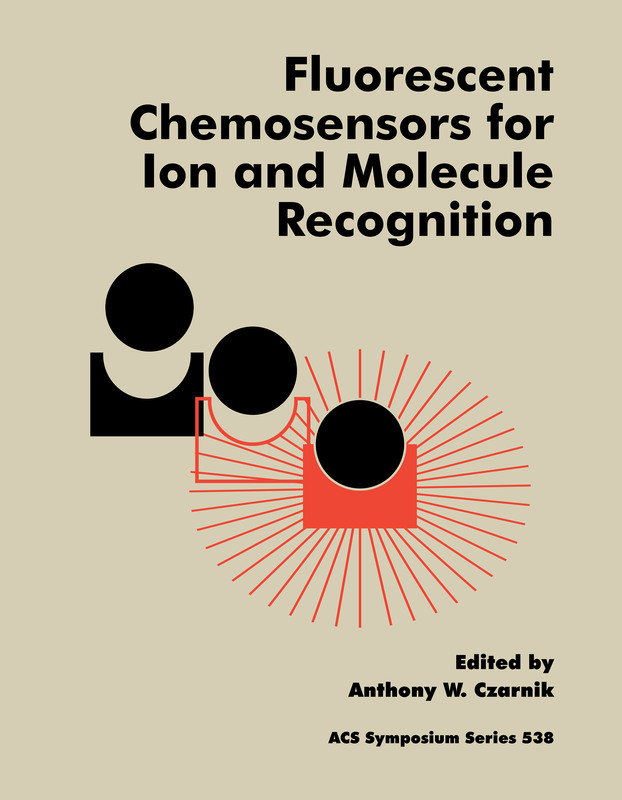 The Royal Society of Chemistry is celebrating the 60th birthday of Anthony Czarnik and the 65th birthday of AP de Silva with an online collection on ‘Chemosensors and Molecular Logic’, published across several of our journals. This themed web collection highlights the current state of the art and future directions in these two closely linked fields. With the launch of this issue, we decided it’s time to get to know Professors Czarnik and de Silva better! Read our interviews below where we ask them about their research, hobbies and what drives them. Tony Czarnik began his research career in 1983 at Ohio State University, where he worked for ten years. He then worked as Director of Chemistry at Parke-Davis Pharmaceutical Research, Sr. Director at IRORI Quantum Microchemistry, CSO at Illumina, and CSO at Senseonics. In 2003, he founded Protia, LLC – spin-offs include Deuteria Pharmaceuticals (sold in 2012), Deuteria Beverages, Deuteria Agrochemicals, and Deuteria Biomaterials. In 2012, Dr. Czarnik co-founded DeuteRx, LLC with Dr. Sheila DeWitt. Today, his sole executive position is that of Manager, Deuteria Beverages, LLC. 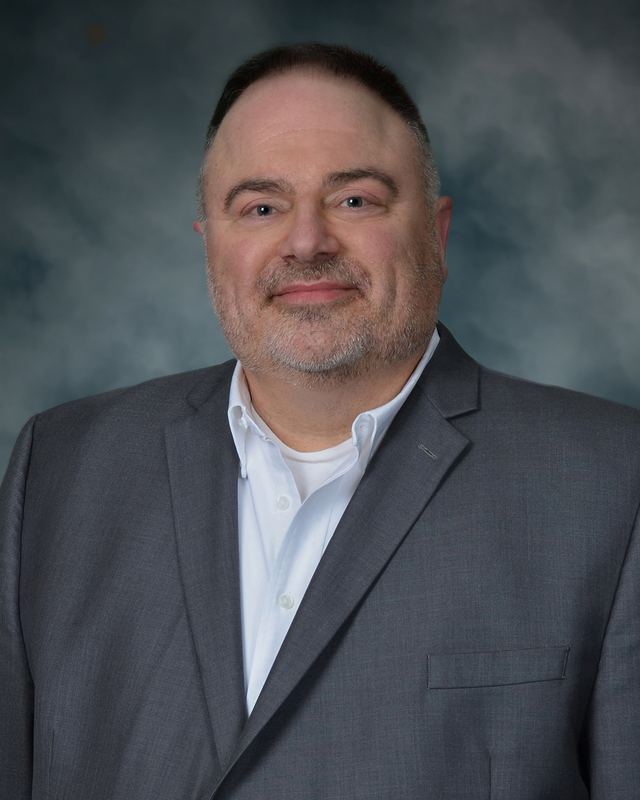 Dr. Czarnik’s research interests have included fluorescent chemosensors, combinatorial chemistry, RNA-targeted small molecule drugs, DNA sequencing using self-assembled microarrays, and improving chemical products using deuterium enrichment. The unifying focus of his work has been creating new ways in which chemists can be useful. What do you enjoy about research and what do you dislike? My organic chemistry lab courses drew me into Chemistry. I loved the smells- even the nasty ones. I loved having squeaky clean glassware, and having just the right wrist action to put a solvent bottle’s cap on with one adept motion. I was transfixed by the notion that distillation and crystallization could be used to turn horrible black messes into colorless, pure liquids and solids. I still don’t understand why crystallization works on such wildly different classes of compounds. What is the greatest challenge you face in your research? Waiting. For everything. Many important discoveries are initially unexpected. Has it ever happened to you? Yes, in fact in the fluorescent chemosensors area. A student made a ZnCl2 complex of an anthracene diamine and prepared a solution of it for NMR. For no good reason, I shined a UV lamp on the NMR tube. It glowed bright blue. We then set upon a path to understand why. What is your hobby? Is there any relationship between hobby and research life? I play piano. In 2010, I earned my Master of Music degree in Composition. At some point during my studies, it hit me that the piano keyboard was actually a periodic table… just with the rows laid end to end. It actually looks like the Periodic Table of the Elements when laid out as on an organ. That was a cool flash of insight. How to balance the work and your life, and how is your family life? I never learned to do it well. My family has forgiven me time and time again, and so today I am still part of a family. Who do you think is very important when you chose chemistry as your career? My seventh grade science teacher, Mrs. Anne Graham. She told me that I would become a chemist, and then went on to encourage my interest. She and her husband, a student in Paper Chemistry, gave my family a tour of what was the ‘Institute of Paper Chemistry’ in Appleton, Wisconsin where I grew up. Mrs. Graham set me on a course, and I never waivered from it. That was lucky for me. I still think of Mrs. Graham often. Do you have any tips for doing successful scientific research? Donald Cram, 1987 Chemistry Nobelist, was also a surfer. He once told me that success in Chemistry was similar to success in surfing. ‘Look out in the distance and learn how to predict which wave will break at the right time for you to ride it.’ Having that skill greatly increases one’s chance to work on a topic deemed to be ‘important’. If you were not a chemist, which career would you choose? With perfect hindsight, I would like to have been a documentary filmmaker in the ‘Ken Burns’ style. Prof. de Silva was born and raised in Colombo, Sri Lanka where he completed his undergraduate studies at the university. He moved to Belfast to enjoy PhD and post-doctoral studies at Queen’s University. He then returned to the University of Colombo for family reasons, before continuing his teaching and research career at Queen’s University. AP de Silva has been a visiting professor at various universities, including the Universite Catholique de Louvain, Chulalongkorn University and East China University of Science & Technology. 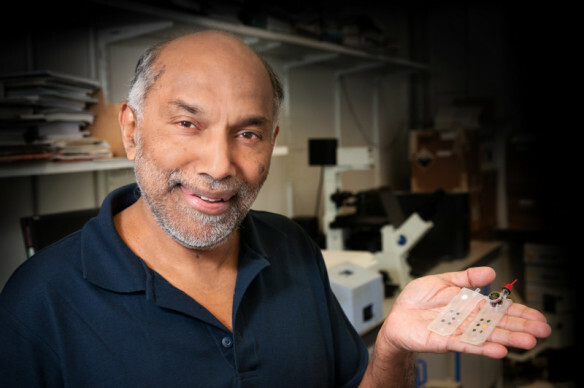 He received the Royal Society of Chemistry’s Sensor Award in 2008 and the Inaugural International Award for Molecular Sensors and Molecular Logic Gates in 2012. He has also written a book ‘Molecular Logic-based Computation’ published by the Royal Society of Chemistry in 2013. Prof. de Silva’s research interests include supramolecular photochemistry, which led him and co-workers to connect supramolecular/coordination interactions, fluorescence and photoinduced electron transfer (PET) in the mid-1980s. With his co-workers, he generalized fluorescent PET sensor/switch behaviour into a predictive design tool for measuring target concentrations. AP de Silva consulted with Roche Diagnostics when the OPTI blood gas and electrolyte analyzer was designed and built, which is now sold by Optimedical (optimedical.com) and Idexx Laboratories (idexx.com). 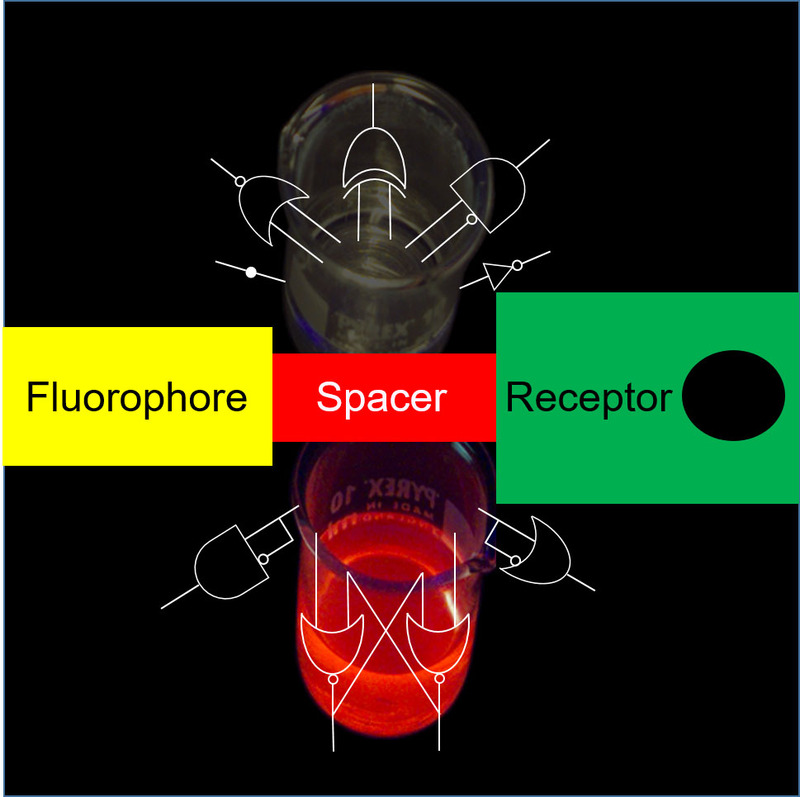 Extension of the ‘fluorophore-spacer-receptor’ system led him and co-workers to invent the experimental field of molecular logic-based computation. Now we understand that sensors are the simplest examples of molecular logic devices. Over 550 laboratories worldwide have contributed to this field so far, by showing that the concepts and processes of computer science can be transplanted into molecules and chemical interactions/reactions. What excites you most about the field of Molecular Logic? Excitement never lasts too long and is associated with the emotion-driven parts of our lives. While science is very enjoyable, it usually arises from our rational faculties, develops slowly and leaves lasting impressions. I find the field of molecular information-handling enjoyable because it is a natural progression from the human version, except on a far-smaller size-scale. What is the greatest challenge you face in your research? The unknown. But then, isn’t that what draws some of us to research? Many important discoveries are initially unexpected. Has it ever happened to you? The meaning of ‘initial’ and ‘expectation’ changes with time and person. I didn’t understand expectation at birth. I didn’t expect molecular logic until I had ruminated on what a physicist friend, Satish Namasivayam, had taught me about elements of digital electronics. The limits of computation experts at IBM didn’t expect molecular logic to be worthwhile even after its announcement and even though our brains are molecule-based. Thankfully, over 550 laboratories have contributed to the field since then upto now. Serendipity has never been too far from anything worthwhile that I’ve done. How to balance the work and your life? I am grateful that the work required in research does not have to be mind-numbingly hard and continuous. Since research benefits greatly from reflective periods (including periods where the brain spools away on problem-solving unknown to us), considerable time is freed up for us to get on with our general lives. What is your hobby? Is there any relationship between hobby and research life? I have been fortunate to play in an Irish traditional music band for nearly 20 years now. When musicians who read each other play in a circle, with the music bouncing around inside, there are moments of brilliant intensity which are truly exciting. What are your suggestions to young generations to encourage them to consider a career in science? There are many aspects of life where truths have to be taken on trust, where truths depend on those in powerful positions or where truths have little meaning. All these situations are less than satisfactory. I like science because truths tend to get established by the cumulative critical efforts of many contributors. Even the subsequent modification of those truths occurs in a similarly considered way. There may be those in younger generations who wish for similarly dependable truths. Then they are scientists-in-the-making. How do you define ‘a successful scientist’ and how to achieve it? For me, a successful person is someone who contributes to the success of others. Several old philosophies have discussed this view at length. Then, a scientist can be successful by contributing to how other scientists think, how other non-scientists think and how other people live (in that order). Do you have any tips for doing successful scientific research? Learning bits about as many things as possible helped me to attempt bridging of disciplines. Read the collection and stay up-to-date with new additions here. The 6th International Conference on Molecular Sensors and Molecular Logic Gates (MSMLG 2018) will be held at Dalian University of Technology from 3-6 June 2018. At the meeting two of the Guest Editors of this themed issue, Engin Akkaya (Bilkent University) and Tony D. James (University of Bath), will receive MSMLG Czarnik Awards. In addition Youjun Yang (ECUST), Zhaochao Xu (Dalian Institute of Chemical Physics), Alexander Schiller (Friedrich Schiller University Jena) and David Margulies (Weizmann Institute) will receive MSMLG Czarnik Emerging Investigator Awards. For more details and registration details please see the conference web site (http://msmlg2018.dlut.edu.cn/). *Reprinted with permission from Fluorescent Chemosensors for Ion and Molecule Recognition, Czarnik, A.W., Ed. ; ACS Symposium Series 538; American Chemical Society: Washington, D.C., 1993; cover image. Copyright 1993 American Chemical Society.